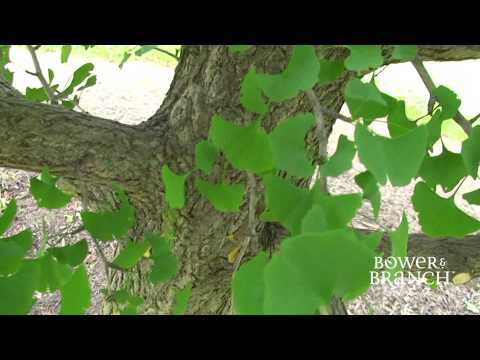 Whether or not Ginkgo biloba supplements are a good investment in your health is debatable, but whether the Ginkgo biloba tree is a good investment for your landscape is beyond question! This majestic shade tree will line your driveway, shade your deck, or accent your home in style, providing many years of enjoyment. Autumn Gold Ginkgo’s fan-shaped leaves will delight you in fall when they turn brilliant yellow and drop all at once. Your family might hold a friendly wager on when they’ll fall! The ultimate legacy tree, the Ginkgo tree is capable of living hundreds—even thousands—of years, so plant it where it may live out a long and glorious life. With no living relatives, the Ginkgo is one of the oldest trees in the world. Sometimes called “a living fossil," it appears unchanged from fossils found 270 million years ago. When the atomic bomb was dropped on Hiroshima in 1945, six Ginkgo trees were found to be the only surviving plants. Soon after the blast, they began to bud without any major deformities and are still alive today. Thus, Japan regards the Ginkgo as “the bearer of hope." After planting this outstanding tree, you will never forget its beauty! It has unusual fan-shaped leaves with distinct veins, and it is the only tree with lobed leaves in America. It turns an incredible clear yellow color in fall, putting on a wonderful display. It’s free of pests, and don’t worry about any horror stories you may have heard about its foul-smelling fruit—we only select male varieties, so they will not produce any fruit. In recent years, Ginkgo biloba (the natural supplement) became well-known for its supposed ability to improve short term memory...and…what was I saying? On the other hand, the actual Ginkgo tree is best known for its unique fan-shaped leaves. And, these trees are incredibly easy to grow. You can plant them and forget about them...unless you don't want to forget. Then, you might want to take your supplements. But why male Ginkgo trees? Female Ginkgo trees produce a fruit that, as it matures and falls to the ground, can emit a rather unpleasant odor. When dealing only with male trees, you don't have to deal with this foul-smelling fruit, as the males won't produce fruit! Ginkgo trees like full sun and tolerate a wide range of soils, including well-drained to dry soils. After planting your tree, apply an annual application of low-rate fertilizer. You only have to do so for the first three years or so during the fall season. Pruning isn’t really necessary. The Ginkgo tree has absolutely no pest problems and they are pollution-tolerant, making them ideal for city dwellings. While you'll often see them planted along city streets, this isn’t necessarily the best location for this particular tree. While the Ginkgo is slow-growing, it does mature to a rather large size, which might be too big for a curb-side planting. You can, however, plant it in your yard. Then, simply sit back and admire your Ginkgo tree as you try to remember where you put your reading glasses. 6-8' tall, stem caliper over 1 1/2", branches developed and limbed up to 5'. Slow growing when young. No further pruning required, the work is done. A very good value.